Here is a little about our proud heritage. reaching out in love to support God's will in the world. LIME ROCK & "AMERICAN BAPTISTS"
Welcome to Lime Rock Baptist Church, an historic church community (ca. 1831) that has a thoughtful and practical balance of service to families in need, strong camaraderie with one another, and a sincere commitment to our Christian faith. Lime Rock has served the town of Lincoln and the surrounding communities for nearly two centuries with a compassion and humility clearly reminiscent of Gospel faith. Visitors will quickly notice that this is an unpretentious, caring community with open hearts and minds. It’s also impossible not to notice that we are a church with a strong tradition of just having fun. At Limerock there are times for worship and quiet contemplation, and times for light-hearted laughter (There is a time to every season - Ecclesiastes). You are warmly invited to the Lime Rock experience, where an atmosphere of mutual respect and support are enjoyed. We seek not only to share our faith and explore the scriptures, but we're also interetsed in, and respect the faith of others. Please visit us anytime to see what we’re all about. We would love to have you join us in a rewarding, liberating and celebrative journey of faith. WHAT IS AN "AMERICAN BAPTIST?" American Baptist Churches (about 5,000 in the U.S) are often substantially different than many other Baptist churches. Most people, when hearing the word “Baptist,” likely imagine the Southern Baptist church because of its sheer size (45,000 churches). Southern Baptists are the largest Protestant denomination in the U.S. and have a reputation for espousing fundamentalist perspectives of Christian faith. Consequently, many people tend to lump all Baptist’s together into the same mold. The first Baptists settled in Rhode Island fleeing religious persecution in Massachusetts. As a result they sought and eventually obtained the first legal charter in America from King Charles II of England granting them autonomy from the English Throne. For this reason, many Baptists today, including Lime Rock, emphasize religious freedom for both the individual and local churches. The authority of the church at Lime Rock rests solely with the members of Lime Rock. Each individual member is likewise given the freedom to follow his/her own conscience in matters of belief. An historic example of these distinctions between Baptists unfolded in the 19th century when Baptists in the North split with Baptists in the South over slavery, with Northern Baptists eventually re-naming themselves “American Baptists.” This historic split among Baptists is evidenced today in the starkly contrasting views of fundamentalist Baptists and progressive Baptists. For example, many Southern Baptists still uphold prohibitions against women becoming pastors along with other restrictive beliefs that American Baptists find either inconsistent with basic human respect, and a God who is equally concerned for all people without prejudice. Some members of Lime Rock have been Baptists all their lives. Other members joined the Lime Rock community after being raised Catholic, Presbyterian, Methodist, or without any religious tradition at all. Such eclectic beliefs co-exist at Lime Rock through a key belief among early colonial Baptists called Soul Liberty. Soul Liberty is a Baptist ideal that helped inspire the First Amendment of the U.S Constitution (Congress shall make no law respecting an establishment of religion, or prohibiting the free exercise thereof). We have the pleasure to inform you that during the past winter and spring a very precious and extensive revival of religion was experienced in this place… As the fruits of this revival, on the 5th of last April a regular Baptist Church was formed...which consists of 24 members. During the first few years, Sunday School Missions were organized in Albion, Lime Rock and Ashton. On August 18, 1835 at a regular church meeting held in Lime Rock the church changed its name to the Lime Rock Baptist Church in Smithfield. In January 1836, the Lime Rock Baptist Society was incorporated by an act passed in the Rhode Island State Legislature. The purpose of the incorporation was the erecting of a meetinghouse for the public worship of God in the vicinity of Lime Rock; the supporting and promulgating of the Christian religion, according to the forms and usages of the Baptist denomination. 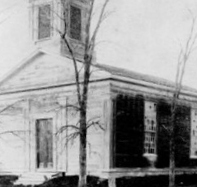 On August 18, 1836, the first church was dedicated at the corner of Great and Meeting House Roads in Lime Rock. On October 20, 1843, the church name was changed to Lime Rock and Albion Baptist Church. By early 1873, the meetinghouse had fallen into disuse; in 1876, the meetinghouse was struck by lightning and burned. From 1873 to 1886, meetings were held in the Lime Rock Hotel on Great Road. The Lime Rock Hotel was later known as the Mowry Tavern. In January 1886, the Charter was amended, by an act passed by the Rhode Island State Legislature, to rename the official title of the church to the Lime Rock Baptist Church in Lincoln. On September 29, 1886, a new chapel was dedicated on Wilbur Road. In 1889, the carriage shed was built to shelter the horses and, in 1938, the sanctuary was remodeled. In 1952, a Fellowship Hall and a new kitchen were added to make more space available for Sunday School and other functions. On June 2, 1973, a new church (our present church) was dedicated on Great Road.